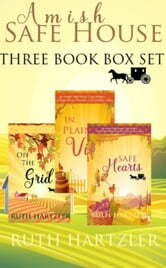 All THREE books in this Number 1 Best-selling series! Each book is a 30,000 word Christian Cozy Mystery Novella. Kate Briggs is a U.S. Marshal who works in WITSEC, the federal witness protection program. After an attempt on her life, her boss sends her to live in a small Amish community until the mole in the agency is found. Will Kate, who is used to the ways of the world, be convincing as a sweet Amish woman? When a murder is committed in the community, how will Kate assist the handsome police officer heading up the case without revealing her true identity? And will Kate be able to leave behind her English ways as she finds herself off the grid in more ways than one? U.S. Marshal, Kate Briggs, is beginning to adjust to the Amish ways. Yet when a murder occurs in the nearby town, how will she solve it without arousing the suspicions of the handsome detective, Ryan Weaver, and blowing her cover? What does Kate do that causes her WITSEC boss to want to extract her from the peaceful Amish community? Will Kate leave the Amish, or will she stay? U.S. Marshal, Kate Briggs, is still posing as an Amish woman. When the cousin of one of the Amish Knitting Circle ladies is accused of murder, Kate once again throws herself into the investigation. However, the criminal looking for her has finally tracked her down to the small Amish community in which she is hiding. How will Kate protect not only herself, but the entire community, from the desperate criminal? When Kate’s identity is revealed, how will everyone react, especially Detective Ryan Weaver?